Kefu was a powerful and skilful No.8 who won 60 caps for Australia. 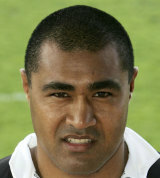 The Tongan-born forward made his international bow for Australia in August 1997 as a replacement against South Africa in the Tri-Nations. He gained his first start in 1998 as the Wallabies mauled England 76-0. By the 1999 Rugby World Cup Kefu was a central figure for the Wallabies and played a crucial role as they went on to lift the William Webb Ellis trophy for the second time. Kefu missed the 2003 Rugby World Cup in Australia after cracking his shoulder bone in a Tri-Nations clash with New Zealand earlier in the year. With his international career behind him, Kefu, who made more than 100 appearances for the Reds in Super Rugby, moved to play his rugby in Japan before taking up a coaching role with the Sunshine Coast Stingrays in 2010. In 2011 he aided Tonga with their World Cup preparations.